Happy New Year! and New Books! and New OLM! 2016 is getting off to a good start in my corner of the world. For one thing, I have a lovely array of new books, thanks to the kind people who basically ran my entire Chapters wish list. Isn’t that an enticing stack? My problem now is that I can’t decide where to start: rereading Mr. Impossible, because I know how fun that will be? rereading Little Women, because I finally have my own elegant edition? embarking on Jane Smiley’s ‘100 Years’ trilogy? plunging into Fates and Furies? wandering New York with Vivian Gornick? I suppose I could postpone the decision by settling down to finish The Portrait of a Lady — not least because I don’t want to read The House of Mirth until I’ve done that. It’s not just the beginning of a new year, of course: it’s also the beginning of the month, and that means, as always, that a new issue of Open Letters Monthly has just gone live. I’m in it a couple of times: in brief in our feature of most-anticipated books of 2016,and at greater length in an essay about different editions of Middlemarch that is also a review of the elegant new Penguin Classics Deluxe edition. I’m always wary of writing autobiographically, but I couldn’t think how else to approach this review, and I enjoyed reflecting on the versions of the novel I’ve accumulated over the years as well as on how the editions we read of a book affect the relationship we develop with it. As usual, the issue includes a wide range of other interesting pieces. One of my favorites this time is Dorian’s essay on D. H. Lawrence’s Women in Love. My own experience with Lawrence so far is limited and ambivalent — but it has certainly made me curious, and Dorian writes so eloquently about both the language and the ideas of Women in Love that I’m feeling emboldened to read more Lawrence before too long. My co-editor Robert Minto offers a fascinating essay on Nietzsche’s Anti-Education, recently reissued by NYRB Classics, finding in it strains that might serve as cautionary to today’s “anxious citizens of academia”; Steve Donoghue reviews (as only he can) a new book on Sigismondo Malatesta, the only man ever to be reverse-canonized; Barrett Hathcock explores the hall-of-mirrors sensation of finding himself fictionalized by a student in his own creative writing class; and that’s just the top half of the Table of Contents. I hope you’ll check it out, and if you like anything about what we produce every month at Open Letters, I also hope you’ll consider supporting our efforts — we are entirely sincere when we say that a comment or a link is as welcome as a donation. Very soon, I will also be launched on the new term. My classes this time are familiar ones in my teaching rotation: Mystery and Detective Fiction and 19th-Century British Fiction (Austen to Dickens edition). As usual, I’m feeling equal parts anticipation and dread at the prospect of starting it all up again. (I have already had one very typical anxiety dream in which I was unable to print notes or handouts because my files had disappeared, and the computer kept auto-updating as I desperately tried to find them, and the start time for class came and went … you’d think after all these years I would not need my subconscious warning me to prepare for class, but this did prompt me to go to campus early and print all my notes and handouts for Monday, so that’s good, I guess!) I’m also feeling very aware that this time last year my sabbatical term was just beginning: inevitably, I guess, that is provoking some reflection on how I used that time and what has become of the projects I worked on since it ended — more about that eventually, along with more of my regular posts on how things go in my classes. But I still have one more full day, and since I did print my materials early (and have also built my Blackboard sites and labelled my folders and made my Powerpoint slides for opening day), I will spend it reading — if I can just settle on which book. Happy New Year! I love your Middlemarch essay! It’s very interesting, and I liked reading your point of view. I own two copies of Middlemarch: the Penguin and the Oxford. I like to have footnotes or endnotes any time I read a work of classic literature. I am not a scholar, but I am obsessed with Dante’s Divine Comedy and own many versions of this work. But my excuse is that it’s in a language I don’t read so several translations are needed! 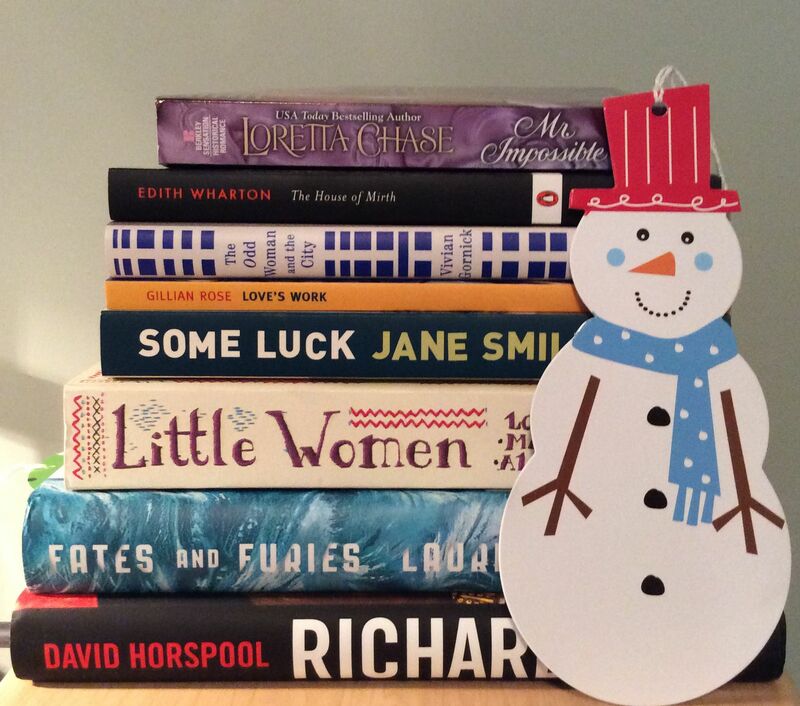 I hope you enjoy all your Christmas books. And yes, I agree that you should finish Portrait so that you can compare his writing to Wharton’s, too. I recall Harold Bloom writing that Newland Archer in The Age of Innocence was written as a sort of counterpart to Isabel Archer. Good luck with the start if your classes! Forgive me if I’m rather glad about your anxiety dream. There wasn’t a year in my life in education from moving to secondary school at 11 to retirement when I didn’t have a panic attack on the first Friday night of term convinced that this year was going to be the year I was found out as a complete fraud who simply couldn’t cut it. I am just so relieved to find that I’m not alone. Your term will, of course, be brilliant.